Q: What are Topcon’s PASCAL lasers? A: The PASCAL Streamline and Synthesis lasers are sold by Topcon Medical in the US. They are for use in photocoagulation of the posterior segment of the eye (retina and choroid). According to the manufacturer, they are able to achieve satisfactory treatment results with lower overall energy output compared to other laser photocoagulators so that there is “less collateral heat damage to surrounding tissue”. Other unique features are the ability to program treatment patterns in advance and implement them during a laser session. The PASCAL lasers are suitable for use in both office and facility settings. Q: What are the indications for laser photocoagulation treatment of the posterior segment? A: There are many. Most commonly, this is done for treatment of diabetic retinopathy (focal or panretinal)1,2 and surrounding retinal holes or tears to prevent retinal detachments.3 Other ophthalmic conditions may benefit from laser photocoagulation, such as macular edema (e.g., branch or central vein occlusions). Q: Is posterior segment laser photocoagulation covered by Medicare and other payers? Be sure to check for private payer or Medicare Advantage (MA) coverage guidance before initiating treatment and to determine if prior authorization is required. Q: What CPT codes describe posterior segment laser photocoagulation? 67229 Treatment of extensive or progressive retinopathy, 1 or more sessions, preterm infant; (less than 37 weeks gestation at birth), performed from birth up to 1 year of age (eg, retinopathy of prematurity), photocoagulation or cryotherapy. Q: Are these codes bundled with other services? A: Yes. According to Medicare’s National Correct Coding Initiative (NCCI), which is revised quarterly, there is an extensive list of bundled codes. In addition, CPT codes 92225 and 92226 (extended ophthalmoscopy, new and subsequent) are bundled with these surgery codes when performed the same day or in the global for the same eye. Q What does Medicare allow for the surgeon for these laser photocoagulation codes? 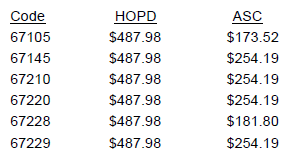 These amounts are adjusted by local geographic indices; actual payment amounts will vary. Q: If we need to repeat laser photocoagulation of the posterior segment, is it billable? In 2016, 67228 was changed to a global period of 10 days; in 2017, the same change was made to 67105. Consequently, these codes are reclassified as minor procedures, with possible restrictions on billing the same-day eye exam. See our FAQ on Modifier 25 for more information. Remember that global periods do not exist for facilities – each laser treatment is billed. Q: What does Medicare allow for the facility fee for these procedures? 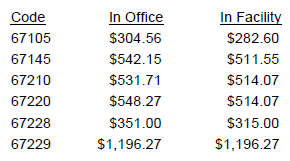 These amounts are modified by local indices, so actual payments will vary. 1 National Eye Institute. Press Release. Laser Treatment Effective for Diabetic Retinopathy. April 1, 1976. Link here. 2 National Eye Institute. Clinical Alert to Ophthalmologists. Early Treatment Diabetic Retinopathy Study (ETDRS). October 30, 1989. Link here. 3 American Academy of Ophthalmology. Preferred Practice Patterns (listing shows multiple document access). Link here. 4 National Government Services, Inc. LCD L33628. Panretinal (Scatter) Photocoagulation. Rev eff. 10/01/2016. Link here. © 2018 Corcoran Consulting Group. All rights reserved. No part of this publication may be reproduced or distributed in any form or by any means, or stored in a retrieval system, without the written permission of the publisher. CPT is a registered trademark of the American Medical Association.